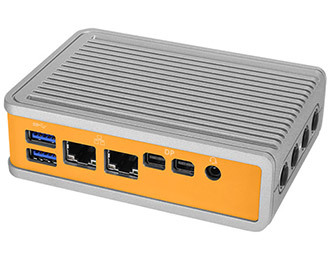 The TM110 comes with a ThinManager® BIOS installed (requires ThinManager 11 or higher, and Firmware Package 9), creating an energy-efficient, ultra-reliable, ultra-small fanless thin client virtualization solution. ThinManager® Thin Client Management Software offers an easy to integrate solution ready for any industry, allowing for terminal server and thin client management that is easy to setup and maintain. Advanced control and security features including auto power on, shadowing, MultiSession, dual display, and failover support, as well as integration with Citrix, VMware and Active Directory. The TM110 is ready for silent, maximum uptime operation. The TM110’s industrial-grade Hardshell Fanless Technology not only looks good, but also protects the system from dust, debris, chemical, and moisture ingress. Its unique cast aluminum chassis efficiently dissipates heat while allowing for space-saving mounting options such as VESA, wall, and DIN rail mounting. The system fully utilizes its sides for I/O. 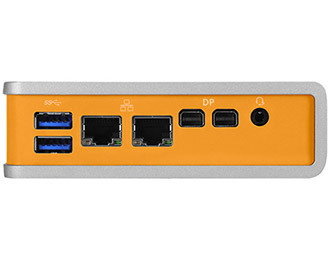 The front and bottom include two USB 3.0 ports, up to two Gb LAN port, up to two mini-DisplayPort, one USB 2.0 port, and a 9 pin RS-232 box connector COM port. Despite its diminutive size, the TM110 has the level of expansion found on larger boards with two mPCIe slots (one full-height, one half-height) for mPCIe expansion cards. 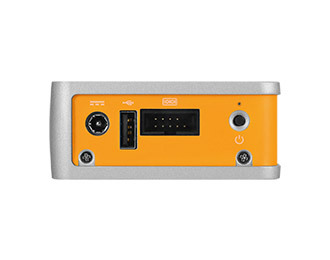 An mSATA slot (shared with the full-height mPCIe) or microSD card slot on the back gives you additional options when it comes to storage. 4.57" x 3.23" x 1.34"
This system requires ThinManager 11 or higher, and Firmware Package 9. Be sure your TermCap version is the latest available. Download here. ThinManager-ready thin clients have their USB ports disabled as a bootable device by default. For ThinManager software support please visit their support page.